Three Class C Top 10 teams. Twenty-one state-ranked wrestlers. Five #1 ranked wrestlers. Two weight classes loaded with four ranked wrestlers each. The quality of wrestlers certainly produced some scintillating mat competition enjoyed by large, enthusiastic crowds both days. And, at the end of the event, host Boone Central/Newman Grove had provided plenty of highlights, to the delight of Cardinal fans. 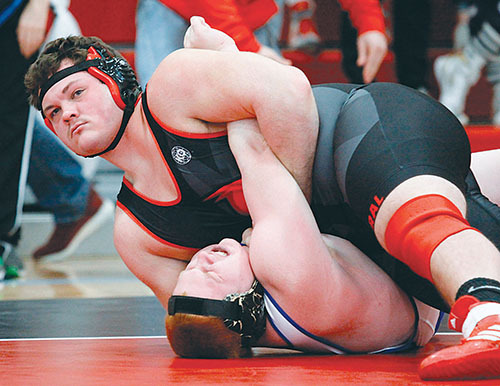 Senior Jon Merten continued his stellar senior season by winning the 220-pound district gold medal, and will be joined by seniors Ethan Dozler (160) and Dalton Rasmussen (285), junior Will Grape (120) and freshman Gavin Dozler (106) at this week’s 2019 Nebraska State Wrestling Championships. That quintet led BCNG to a solid fifth-place finish in the 16-team C-2 field of teams. “What a great showing by the team this weekend, punching five tickets to the state tournament. And, the team members who did not qualify, also wrestled the best they have all season,” praised Cardinal Coach Josh Majerus. “I’m very proud of all the guys and the energy they gave Friday and Saturday. Indeed, the BCNG state qualifiers have the ultimate test and reward ahead, led by Merten. 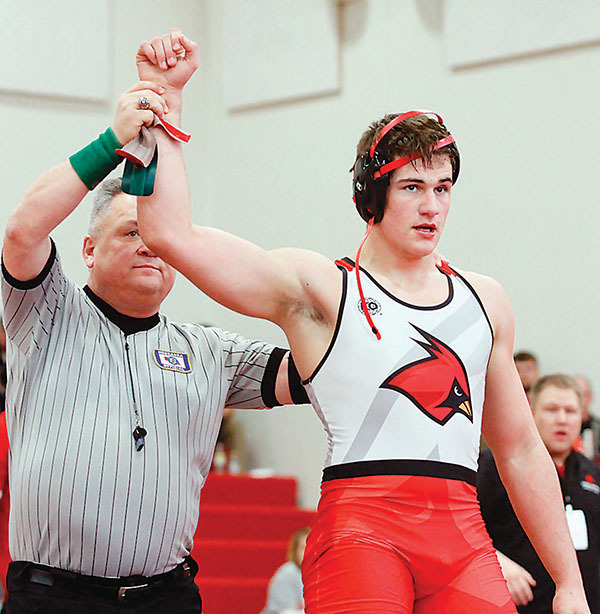 The Card senior, ranked #1 in Class C entering district competition, needed to defeat #2 ranked Josh Bailey of Johnson County Central in the C-2 tournament’s marquee match to stand at the top of the award podium Saturday – and did just that. In a battle as razor close as the wrestlers’ ratings, Merten broke a 1-1 tie with a decisive takedown, then held off a last effort by Bailey following the latter’s late escape, for a 3-2 victory. “Jon just does what he does best. He wrestled smart and solid in a potential state finals matchup,” Majerus said. Just missing his own gold medal was Grape, who finished as runner-up at 120 pounds. Ethan Dozler and Rasmussen both earned third place in their respective weight classes, with Rasmussen fighting back from a surprising pin loss in the quarterfinals with three straight clutch wins, including a come-from-behind 3-2 decision in the “heartbreak” round when he tripped up Eric Escobar of Wilber-Clatonia for a takedown in the final seconds. Freshman Gavin Dozler battled to his first state tourney berth after some early controversy. Dozler appeared to score a late point with a reversal escape to upset Wood River’s Dylan Ancheta (43-3) in their semifinal match, only to see the point taken away following discussions between the match official and coaches. Ancheta turned the tables with a takedown and sudden-victory overtime win, but Dozler earned his Omaha invite with a 4-0 decision over David City’s Zach Bongers in the heartbreak round. As always, there were disappointments Saturday, including senior Tyson Haddix losing a pair of late decisions to fall just short of state qualification. The five Boone Central/Newman Grove state qualifiers will conclude their 2018-19 seasons Thursday through Saturday in the state wrestling tournament at Omaha’s CHI Health Center arena.